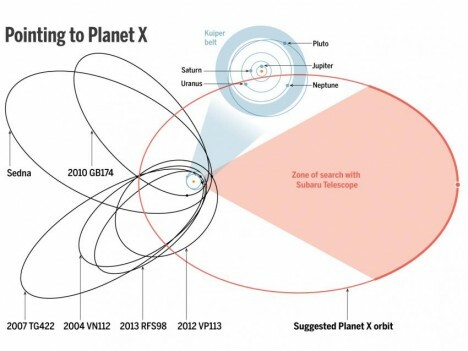 Many planetary fans were disappointed when Pluto was downgraded to the status of “dwarf planet,” but a recent discovery shows there was another and much more mysterious ninth planet waiting in the wings all along, dubbed, for now, simply: Planet X.
Konstantin Batygin and Mike Brown of the California Institute of Technology (Caltech) in Pasadena put forward strong evidence for the existence of this yet-unseen planet, which had been posited previously but insufficiently supported by facts (like gravitational effects and other byproducts of its periodic passing). 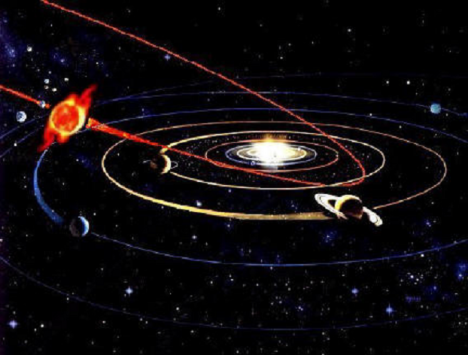 On curious byproduct of the discovery is that the solar system is much bigger than we imagine, stretched out by the wide-ranging orbit of this last piece of the Sol planetary puzzle. “Batygin and Brown inferred its presence from the peculiar clustering of six previously known objects that orbit beyond Neptune. They say there’s only a 0.007% chance, or about one in 15,000, that the clustering could be a coincidence. Instead, they say, a planet with the mass of 10 Earths has shepherded the six objects into their strange elliptical orbits, tilted out of the plane of the solar system.” Meanwhile, astronomers are tilting their telescopes to try and catch a peek of this mystery planet, and some will no doubt remain skeptical until they can see it with their own eyes. See more in Space & Time or under Science. February, 2016.